Sprint picks Golin; Jeb Bush, Hillary Clinton campaign kickoffs; Spokane NAACP head cancels chapter meeting amid controversy. 1. Sprint has named Golin as its strategic communications and creative services AOR, six months after bringing on Visa veteran Doug Michelman as its comms leader. The firm is also handling consumer strategy, corporate reputation, and employee communications for the wireless company, among other duties. 2. Jeb Bush is set to kick off his 2016 bid for the White House in front of what is expected to be a young and diverse crowd in Miami on Monday. Despite early struggles attracting moderates, Bush is still considered the GOP frontrunner by politicos in his party. 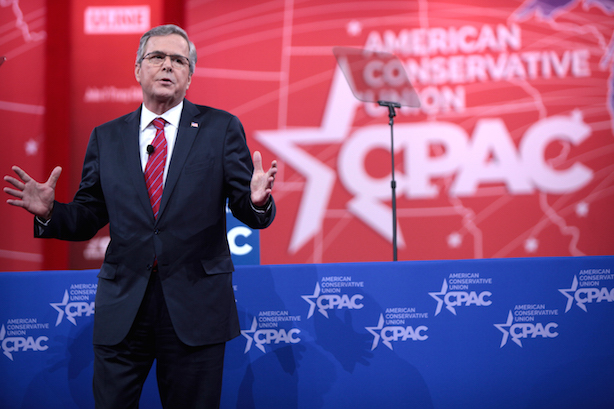 His campaign rolled out the "Jeb!" logo and a video over the weekend. 3. Hillary Clinton held her first major rally on Saturday in New York City, stressing that she’ll be a fighter for the middle class. Two of her top aides previewed the campaign on Friday night in an on-stage interview with Politico’s Mike Allen, saying the theme of "who will fight for you?" will define the 2016 race. 4. Rachel Dolezal, the leader of the Spokane, Washington, NAACP who has been accused of faking her identity to appear African-American, postponed a chapter meeting scheduled for Monday where she was expected to address the controversy. She said she needs to continue to talk about the crisis with regional and national leaders of the organization. 5. CNN anchor Fredericka Whitfield apologized after saying on-air that a man who fired at Dallas police officers early Saturday was "courageous" and "brave." However, Mediaite contends CNN botched its crisis response after her comments. 6. Mixed messages from Saudi Prince Alwaleed bin Talal, an early investor in Twitter who owns 5% of the company. He told Reuters that he would back interim CEO Jack Dorsey if he wants the job on a permanent basis. However, he earlier told The Financial Times that Dorsey should stick with his other job, running Square. Vox looks at why Twitter never reached the size of Facebook.